The ability to test all catalysts simultaneously, under rigorously the same feed and conditions, combined with the proprietary Flowrence® technology used to accurately control all the key process parameters, provides unparalleled precision to discriminate the fine differences between the various catalysts. Every reforming unit has its own constraints, and the portfolio of catalyst vendors often tries to strike the right balance between performance and the ability to accommodate those constraints. Further than paper estimates, the possibility to simultaneously compare catalysts under various plant conditions and with specific feed properties (e.g. amount of coke precursors, the presence of contaminants such as sulfur, etc.) is thus critical to determine the right catalyst. The approach presented here for CCR catalysts can be applied to any system that has a noticeable deactivation over the duration of days, or even up to months e.g Semi Regen Reforming Catalysts. Avantium provides comparative catalyst testing for refineries. Our industry-proven Flowrence® 16-reactors pilot plant enables the parallel comparison of multiple catalysts under the exact same conditions. For some years now, Avantium has been helping refineries select the best-reforming catalysts. The tools, methods applied and resulting data quality (precision, accuracy and reproducibility) have been independently verified and accepted by the catalyst vendors. Axens wanted to evaluate the performance of some naphtha reforming catalysts. Four Axens CCR reforming catalysts were evaluated in a fixed-bed 16 parallel reactor high throughput Flowrence® micro-pilot plant. The performance of the catalysts, defined by activity (temperature required), selectivity (C5+ yield) and stability, was evaluated at fixed product severity. For this test, two octane targets were used but aromatic yield can also be targeted. The so-called iso-RON operation is achieved by using an automated feedback loop between the GC analysis of the effluent and the reactor’s temperature which is thus continuously adjusted. Key results for catalyst performance with time-on-stream are shown in Figure 1. 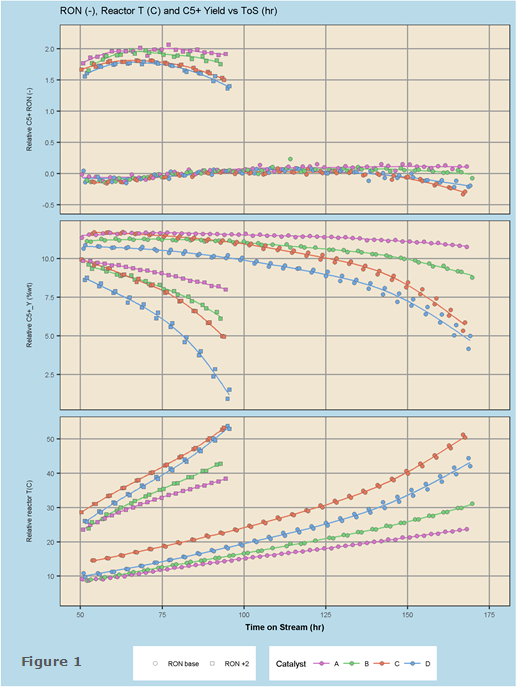 Results obtained through iso-RON operation are easy to interpret for fixed-bed units (SR reforming) but also provide invaluable information about catalyst performance for moving-bed CCR units, which would otherwise be too difficult to operate on a lab scale. Lower temperature-required (higher activity) to reach the specific octane means greater flexibility for CCR operation, while a lower temperature slope is typically indicative of a low coke-make. For a CCR unit, the lower coke-make will provide greater flexibility to increase the product severity (e.g. increased aromatic yield) or to process more demanding feeds like thermal cracked Naphtha. Finally, high catalyst selectivity (C5+ yield) is always desired as long as product severity can be maintained. The stability of the selectivity is typically measured by the length and slope of the stable C5+ yield output before the temperature rises sharply. Analysis of the coke content (Table 1) of the all the spent catalysts confirms the relationship between coke-make and catalyst stability. Table 1 – Relative coke content (%wt) on spent samples. Due to differing yield stabilities the selectivities of the catalysts are different relative to one another at different Time on Stream (hr). The appropriate interpretation of this data is dependent upon the coke content in the spent samples. For typical CCR operation, the weight percentage coke on catalyst passing out of the last reactor and entering the regenerator is generally specified to be less than 5%. Since the CCR catalyst’s coke content increases as it passes through the CCR reactors, the average coke for the CCR catalyst, averaged over all the CCR reactors, is then less than 5%. It is therefore relevant to make the comparison of the relative catalyst yields and activities at appropriate (i.e. coke content <5%) Time on Stream in the iso-RON test analogous to the Time on Stream seen commercially. These trends are completed with the continuous analysis of the product effluent, which provides vendors and refineries with a complete hydrocarbon breakdown for every point in time. The baseline separation of ethyl-benzene and all xylenes isomers, or the breakdown of the C1 to C6 products for example, are crucial for economic and integration studies. An example of the precision and discriminative power obtained is illustrated in Figure 2 plots, where key selectivities are plotted against temperature required at a fixed time-on-stream (80 hrs), with clearly non-overlapping confidence intervals. Thanks to the availability of multiple reactors in the micro-pilot plant, each catalyst system was tested in duplicate for each octane target, in order to provide repeatability and confidence interval on the results.